I’m pretty sure by the time you’re reading this, you’ve probably forgotten about this upcoming shooter by Gearbox, fret not because we are here to jolt your memory and bring you some juicy new info about this upcoming shooter. Revealed back in 2014, Battleborn would be Gearbox Software’s first original games since Borderlands back in 2009. 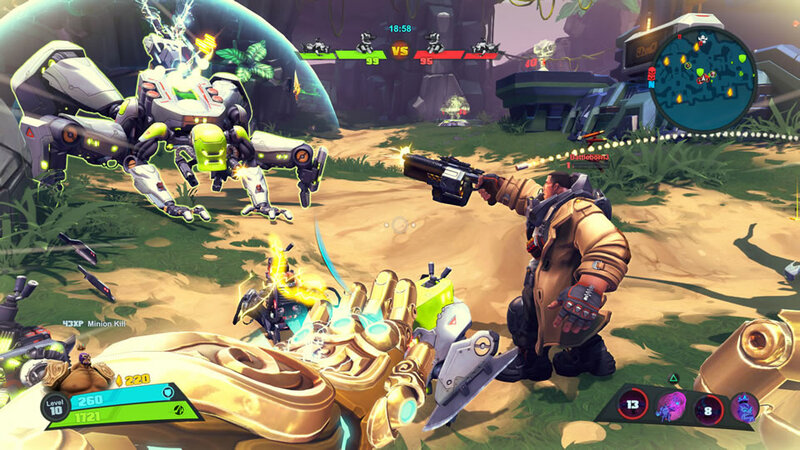 Touted as a Hero Shooter, Battleborn actually boasts an impressive roster of 25 playable heroes on launch day with more content and heroes coming post-release. The term Hero Shooter actually meant the huge and varied roster of playable heroes that populate the world of Battleborn. The huge roster of character here is as diverse as they come; all 25 launch characters are divided into 5 different factions which range from the olive green draped GIs of the Peacekeepers to the Last Light Consortium which is an amalgamation of Victorian steampunk with advanced cybernetics. Each hero within the 5 different factions despite keeping to the general aesthetics of the individual factions bring a myriad of firepower to the battlefield; for example within the Peacekeepers faction, you have Montana who makes up for his lack of brain cells with huge muscles, a can-do attitude oh and an even bigger gun. He is usually found wrestling bears whenever he isn’t absorbing hurt by the truckloads. In addition to Montana, there is also your generic soldier in the form of Oscar Mike who wields a run-of-the-mill assault rifle with a stealth generator and the ability to launch. In spite of the huge roster, you’ll be hard pressed to find two characters that play alike. As unique as each character are, they each still play as one of either 3 roles: Attacker, Defender, and Support. Attackers are agile killers that overwhelm enemies with their sheer firepower such as Oscar Mike’s Airstrike ability. Defenders are the heroes that would walk into a valley of fire and death just to make sure of their teammate’s safety. Finally, a Support is the team’s guardian angel; healing wounds and buffing allies, they might not be the ones slaying monsters but they are the ones keeping everyone alive. With all the hype revolving around the deep roster and the MOBA infused PvP modes (which I would touch on below). Battleborn actually features a full-length story mode introducing all 25 characters and their various motivations. Battleborn is set in a distant future where a mysterious and all encompassing enemy have been destroying every star in the universe except one, named Solus which serves as the last beacon of hope against the encroaching darkness. It’s a well-worn tale of uneasy alliances and an ultimate evil but with that signature Borderlands humor. Player(s) would start out in a designated spot on the battlefield and work towards an objective which in my case was to rescue Caldarius and find a way to convince him to join our cause. For this preview event, I was joined by other journalists, we started out just outside a sprawling snow fortress and instinctively started to push towards the main entrance. 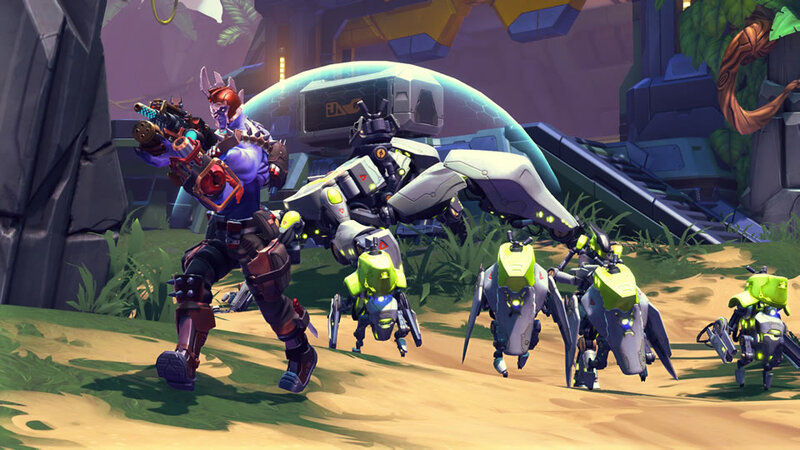 The combat of Battleborn feels like a carbon copy of Borderlands (well duh); don’t get me wrong, it is definitely not a bad thing. The shooting doesn’t have the uber snappy auto-aim of COD; in all honesty, the shooting here feels a little on the looser side but it still feels snappy enough for you to easily acquire multiple targets in frantic firefights. As my merry band of killers moved along, we would frequently be tasked with defending a certain area for a set amount of waves before the story would move forward. Unfortunately, the cycle of pushing towards an open courtyard, clearing it and subsequently defending the said courtyard turns into a freakin tedium when it was all I did throughout the mission. On the bright side; as an aficionado of Borderland’s humorous tone, I was thoroughly satisfied. Quips that fly back and forth between characters and even lines of dialogue from different party members all possess that signature Borderlands distinction. As the single player mission came to a close, the moment I had been waiting for have arrived… The MOBA-esque multiplayer was upon me. The mode we played was named Incursion which involved the destruction of 2 giant walkers while escorting your AI controlled minions…sounds familiar ? Unlike your typical MOBA, the map isn’t split into exactly 3 individual lanes like three lane highways (MOBAs) but the essence of it remains, tight corridors and bottlenecks push opposing heroes together into a furious melee. Building on the concept of MOBAs, once you’ve dished out enough damage, you’ll level up which unlock enhancements to augment your character’s kit. These skill upgrades could be as basic as modifying existing abilities to completely transforming your hero’s passive ability. Like any team based game, team composition is crucial. Go in with a team of 5 Attackers and you’ll see your team crumble the second bullets start flying. Bear wrestling enthusiast Montana was my pick for this match. Unlike most gun wielding heroes, Montana do not need to reload his weapon but he’d have to keep his heat meter in check, overheat his minigun and bullets stops flying lest of course you choose the ability Feeling the Burn in the Helix which completely removes overheating from the equation however Montana would take damage for every round fired beyond the maximum heat capacity. To call Battleborn Borderlands 2.0 would be doing it a disservice, the game does contain everything positive about Gearbox’s hit series but it’s addictive team-based multiplayer breath freshness into the tried and tested formula. Battleborn is available for Pre-Load NOW with the open beta for the PS4 available now while Xbox ONE and PC users would get to experience the open beta on the 14th of April. 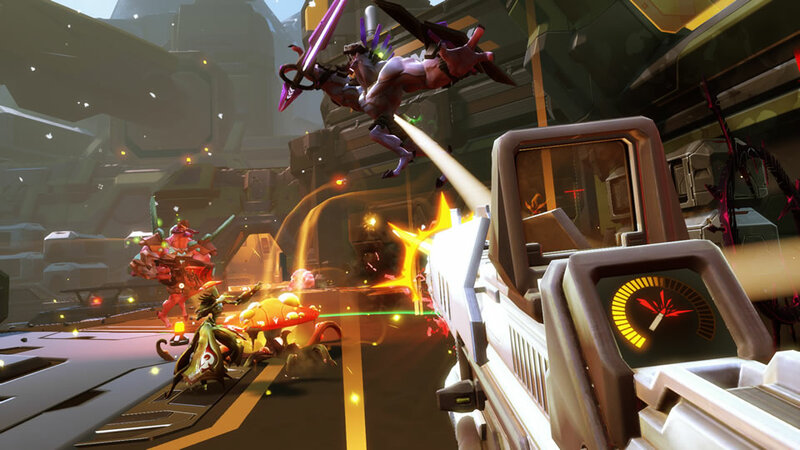 During the Open Beta, you’ll be able to experience the natural progression of Battleborn; including two Story Mode episodes, two Competitive Multiplayer Modes. 25 heroes would be playable with the PS4 getting an additional character.